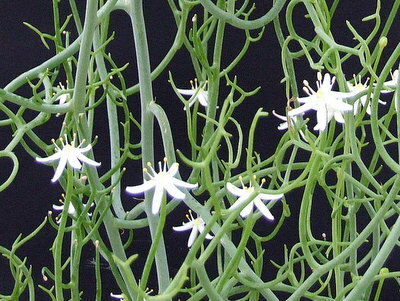 Synonyms: Bowiea volubilis subsp. gariepensis, Peter Vincent Bruyns 1988 - or not! The white flowers and the scaly bulb by Cok Grootscholten. A member of the Hyacinthaceae family, given this name by Ernst Jacobus Van Jaarsveld in 1983. Found in southern Namibia, north-western South Africa, where it grows in well drained soil, some water and sun. 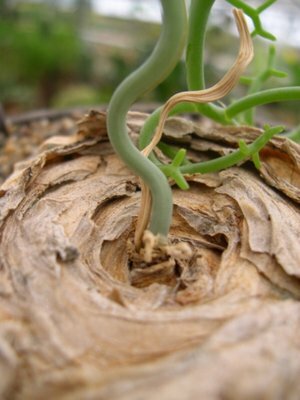 The onion-like caudex can be op to 20 centimetres in diameter, and the branches reaches for op to three meters, but will die back when dried out in summer. 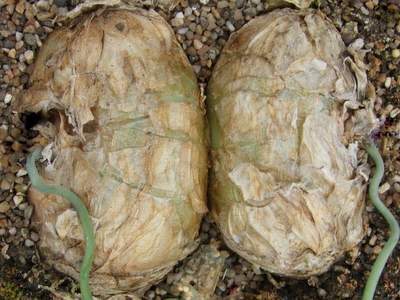 It gets small white-greenish flowers, but can also be reproduced by dividing the bulbs. Different from B. volubilis by the stems being glaucous, prostrate and not veining and the capsule valves are retuse. Highly poison, from root to top! The true leaves that emerge from the bulb are small, very short lived, but they are replaced by the scrambling or twining, branched green flowering stems which reach up to four meters long which are scattered with starry, green flowers. Bowiea is named after the British plant collector James Bowie (1789-1869.